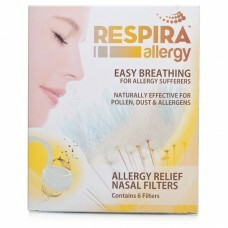 Respira This product stops allergies before they start. A powerful naturally effective way to ease symptoms arising from pollen, dust and allergens. Filters pollen, dust and allergens for a clear airway for hay fever, asthma and other respiratory disorders. Ideal for DAY or NIGHT use. 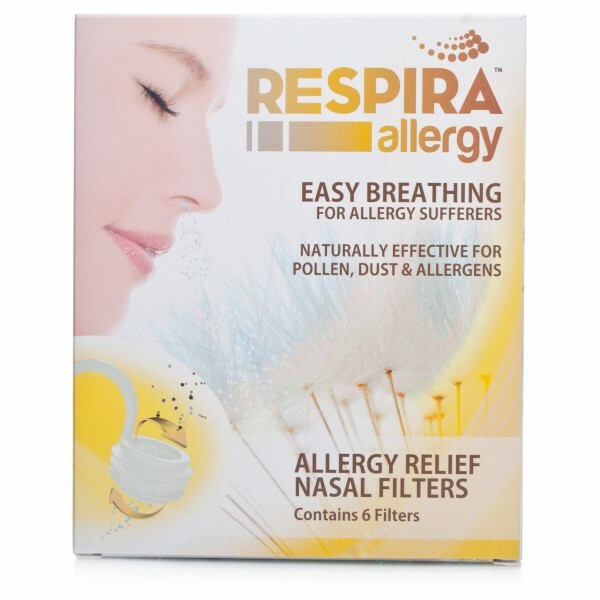 Respira: This allergy product is comfortable and discreet nasal filters to keep airways clear when suffering from nasal congestion, and respiratory disorders including hayfever and asthma. This product is good to take when the sun is out and you are in the garden, and the pollen is high. Naturally effective against pollen, dust & allergens. Traps & filters irritants before they enter nose. Maintains clear airways for respiratory disorders like hayfever and asthma. 6 Nasal Filters in each pack. Each Nasal Filter offers 8 hours of relief. Use Night or Day.